The following players have been declared as inactive for Sunday afternoon’s game between the Green Bay Packers and the Detroit Lions at Ford Field. The Packers have only six inactive players because the current roster is at 52, after LB Andy Mulumba was placed on injured reserve earlier this week. 57 LB Jamari Lattimore will start in place of Jones. 70 T Garrett Reynolds will start for Waddle and 42 S Isa Abdul-Quddus will start for Ihedigbo. DETROIT–The Packers suffered one of the worst losses in the Mike McCarthy era on Thursday, in a 40-10 defeat to the Lions at Ford Field. The outcome was punctuated by the final statistics. With 4:17 to play in the game, the Lions had gained 563 yards to the Packers’ 56, and had run 77 plays to te Packers’ 36. That’s were the game stood following Matt Stafford’s third touchdown pass of the day. The loss left the Packers at 5-6-1 and clinging to fading playoff hopes. At 7-5, the Lions moved into the driver’s seat in the NFC North title race. Quarterback Matt Flynn was sacked seven times, the final time for a safety. He threw for 139 yards, the vast majority of it in the Packers’ final possession. The Packers stayed within reach of the Lions through three quarters, thanks to four takeaways. The Lions’ yardage barrage, however, eventually became overwhelming. The Lions more than doubled the Packers’ time of possession. The Lions’ rushed for 241 yards. DETROIT–The Lions had lengthened their lead over the Packers to 26-10 heading into the fourth quarter of today’s game at Ford Field. Green Bay began the second half with its fourth consecutive three-and-out, and the Lions took possession of the ball at their 37-yard line. Quarterback Matt Stafford’s pass to Calvin Johnson initiated another drive into Packers territory. On third-and-one, Stafford completed a 12-yard strike to Johnson at the 20-yard line. On the next play, Johnson had an apparent touchdown pass in his hands, but failed to hold onto the ball as he fell to the ground. Two plays after that, however, Johnson caught a pass over the middle, broke a tackle and scored. With 9:08 to play in the third quarter, the Lions had a 24-10 lead in a game that was much more lopsided statistically. The Lions had gained 403 yards of offense to the Packers’ 43, and time of possession was 15-and-a-half minutes in the Lions’ favor. The Lions immediately regained possession when Matt Flynn was sacked and stripped of the football. The Lions recovered the fumble at the Packers 37-yard line. Cornerback Sam Shields killed the potential scoring threat, however, by intercepting a pass intended for Johnson in the end zone. Flynn, however, was intercepted by DeAndre Levy and the Lions had the ball at their 35-yard line. Flynn was sacked by Ndamukong Suh for a safety with :53 to play in the third quarter. It was the seventh time Flynn had been sacked in the game. DETROIT — Two touchdown drives in the second quarter for the Lions erased a seven-point deficit and gave Detroit a 17-10 halftime lead. The Lions began the quarter with a 27-yard FG by K David Akers, who came on after a third-and-goal pass for TE Brandon Pettigrew was incomplete. That gave the Lions 159 yards of offense after their first two possessions, but they led only 3-0. The Packers answered with a FG to tie the game. After the kickoff went out of bounds and WR James Jones made a tough 16-yard grab over LB Stephen Tulloch, the Packers were across midfield. 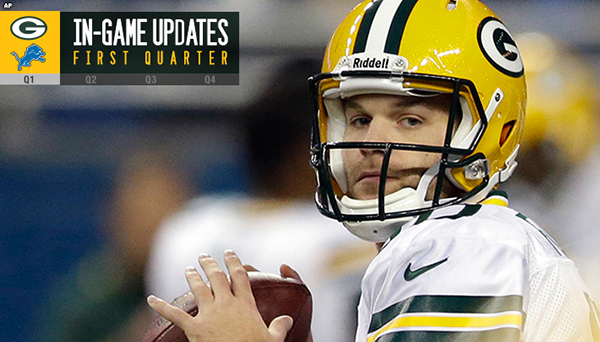 QB Matt Flynn scrambled for 4 yards on third-and-6, setting up a 54-yard FG by Mason Crosby. Green Bay took the lead just moments later. On the first snap of Detroit’s ensuing possession, LB Nick Perry hit QB Matthew Stafford’s arm as he wound up to throw. The ball came loose, and S Morgan Burnett picked it up at the 1-yard line and scored for the Packers to make it 10-3. The Packers defense got its third turnover of the half a handful of snaps later, as CB Tramon Williams picked off a pass intended for WR Kris Durham. A personal foul on Durham for tackling Williams by using the opening of the helmet put the Packers on their own 49-yard line to start the possession. The Packers did nothing with the field position, however, going three-and-out, and the Lions responded with an 85-yard TD drive to tie the game at 10. A 32-yard pass down the left sideline to RB Reggie Bush on third down got the Lions moving, and a 26-yard pass to TE Dorin Dickerson on third-and-1 got the Lions into the red zone. WR Jeremy Ross caught a 5-yard TD pass for the score. After another Packers three-and-out, Ross returned a punt 35 yards across midfield, and the Lions needed just three plays to score again. Bush ran it in from the 1 just one snap after his own 23-yard run put it there. A third consecutive Green Bay three-and-out gave the Lions one more drive in the half, and they took advantage. Passes of 16 yards to WR Calvin Johnson and 19 yards to Durham set up a 31-yard FG try by Akers on the final snap, but he missed wide right. 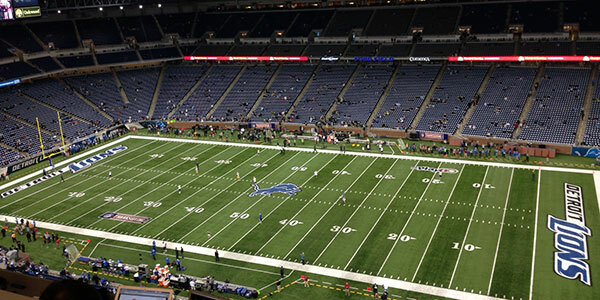 DETROIT–The Packers and Lions were scoreless after one quarter of play at Ford Field on Thursday. Detroit quickly moved the ball down the field on its opening possession, as quarterback Matt Stafford connected on two over-the-middle completions to Calvin Johnson that put the Lions into scoring position. Joique Bell converted a third-and-two with a 4-yard run to the Packers 22-yard line. Reggie Bush gaind nine yards on second-and-nine, but Bush fumbled on the next play and Morgan Burnett recovered the fumble for the Packers, cancelling an almost-certain scoring drive for the Lions and giving the ball to Matt Flynn and the Packers offense at the Packers 10-yard line. Flynn’s first pass on the Packers’ first play was a screen to Eddie Lacy that gained 20 yards. On third-and-eight, Flynn completed a 9-yard toss to Jordy Nelson. Again, Flynn would face third-and-eight, but this time he was sacked by Ziggy Ansah. Sizable gains by Bush and Bell moved the Lions to their 31-yard line. On second-and-one, Stafford pitched a completion to Kris Durham for 14 yards to the Packers 46-yard line. The Packers continued to surrender big chunks of rushing yardage, as Bush ran for 12 yards and another first down, and then a screen pass to Bell broke loose for 27 yards to the Packers 7-yard line. The quarter ended with the Lions facing third-and-goal at the 9-yard line. – Since Mike McCarthy took over in 2006, the Packers are have a 19-8 (.704) record indoors (including playoffs). That ranks No. 2 in the NFL among teams with 10-plus road/netural dome games over that span behind only the N.Y. Jets (8-2, .800). – The Packers have posted at least 390 yards of offense in 16 of the 27 indoor games (12-4 record in those contests) and 30-plus points in 16 of the indoor games (14-2 record). – Green Bay ranks No. 2 in the NFL in total offense with an average of 424.4 yards per game. The Packers’ 4,668 yards this season are the most through 11 games in franchise history. – The Packers have posted 385-plus yards of offense in nine of 11 games this season. – Green Bay ranks No. 2 in the NFL this season with 55 plays of 20-plus yards this season, including 17 in the last three games. – The Packers have rushed for 180-plus yards as a team in five of their last nine games. Green Bay’s 1,539 rushing yards so far this season are the fourth most by the team through 11 games since the 1970 AFL-NFL merger. – Green Bay has had at least one 100-yard receiver in eight of 11 games this season and ranks No. 1 in the NFL with 10 100-yard receivers on the season. The Packers need one more 100-yard receiver to tie the single-season team record set in 1995 (11). – The Packers have allowed three sacks in their last three games and 15 sacks in their last eight contests. Their average of 1.88 sacks allowed per game since Week 5 ranks No. 5 in the NFL over that span. – The Packers have turned the ball over six times in their last six games. – Green Bay’s defense has recorded 13 sacks over the last three games, which ranks No. 1 in the NFL over that span. – RB Eddie Lacy has rushed for 755 yards over the last seven games, which ranks No. 1 in the NFL over that span. – Lacy needs one rushing TD to set the single-season franchise mark for the most rushing TDs by a rookie. He has six on the season, which is tied with Samkon Gado (2005) for the team record. – WR Jordy Nelson needs 53 receiving yards to reach the 1,000-yard mark for the season. He posted a career-high nine catches (later tied) for a career-best 162 yards and a career-high three TDs (later tied) vs. Detroit in the 2011 season finale. – Nelson ranks No. 1 in the NFL with 14 catches of 25-plus yards this season. That is two shy of the top mark by a Packer since 1994 (Nelson, 16 in 2011; Greg Jennings 16 in 2010). – WR Jarrett Boykin has 470 receiving yards since Week 7, which ranks No. 10 in the NFL over that span. – LB Clay Matthews has posted three sacks in the last two games. He has six sacks and an interception in six career games against the Lions.Matthews needs 1.5 sacks to hit the 50-sack mark for his career. – With 866 career points, K Mason Crosby needs nine more to set an NFL record for the most points scored by a player in his first seven seasons in the NFL (Colts K, Mike Vanderjagt, 874, 1998-2004).